The main goal of this publication is pointing to the significance of Excel to be included in accounting educational programs. Furthermore, the author identifies areas in teaching of accountancy, which are inadequate to the competence requirements of the employees of the present accounting departments. She supports that fact with the results of the questionnaire that she conducted and which proved the earlier observed reality. Next to showing the problem the author also submits her own methodology, which should support teaching accountancy to the students. It should help create better conditions to acquiring competences, which are necessary to perform the accountant’s job. The proposed solution has been pre-tested by the author during her classes on accountancy. In view of the considerations from the article, the conclusion can be derived that a new paradigm concerning teaching of accountancy should be worked out, which would take into account the circumstances and conditioning imposed by the current legal, organizational and technological challenges. This publication focuses on the subject, which seems overlooked by scholars, authors of different manuals on accountancy or practitioners though big significance of the herein discussed topics, in the current computerized business environment is indisputable. Key words: accountancy, education, Excel, new technologies, T-Account. Contemporary reality which is strongly related to new technologies thoroughly changes requirements for the professions, which are performer in the 21st century enterprises. Apart from the competences, which are related to the specifics of that particular profession an employee must be equipped with the capabilities related to computer use as well as the applications that are common for that profession. Moreover, following the use of IT technologies economical life faces a very dynamic growth in speed of the data exchange. This takes place not only inside a company but also among different business subjects, not to mention the business – offices environment. More and more information is transferred in an electronic form what imposes an intensive computerization of enterprises. Software market also increased an offer for accounting supportive programs, what leads to the conclusion that programs and teaching tools should also evolve following closely changing expectations for professional competences of employees. This article draws attention to the methods of teaching the accountants being not suitable to the listed earlier conditioning. It also encourages to use Excel spreadsheet as a very powerful tool to teach the accountancy. II: (i)Ethics and professional responsibility, (ii) financial accounting, (iii) Management accounting. III: (i) Systems of managing the on-line trainings, (ii) Traing offer, (iii) Technology assessment. IV: (i) Academic questions and carrier issues, (ii) Abilities and features of students, (iii) Perspectives and approach to learning and evaluation. V: (i) Research, (ii) Teaching, (iii) Other departmental questions (Apostolou et al., 2016). Increasing preparation time, which is necessary to reach success in trainings related to the accountancy and business. Creating the list of the most basic competences and working out the program to achieve them. Designing the multiaspect process of the continuous development, which would support the students in understanding of the key competences in depth. Determining the types and the sequence proper technological elements, which would improve the teaching environment. The authors also draw attention to the content provided, which should be adjusted to contemporary teaching methods and styles. MS Office package has been mentioned here, films, on-line trainings, etc. (Spraakman et al., 2015). Other authors that were also mentioned in that bibliography (Spiceland et al.2015) published the results of interviews they made with 39 main financial, controlling or management accounting officers in the 20 New Zeland firms dealing with IT. These interviews showed that one of the most important tools of IT technology in the accounting management position is Excel. Summing up their work the authors pointed that the programs of most trainings stay unchanged for decades, which raises a big concern. Further on, they say that good teaching programs alone may become an efficient strategy to bring the best and the most skillful people top that profession. (Apostolou et al., 2016). Modern technologies in the education of accountants, including Excel, are more and more often spoken about, but mainly in the context of management accounting. American Accounting Association, Association to Advance Collegiate Schools of Business and American Institute of Certified Public Accountants issued guidelines, which recommend more emphasis on the engagement of modern technologies in the teaching of accountancy, creating for the students opportunity to gain basic skills while studying. American Institute of Certified Public Accountants presented the framework for the basic competences for the accountant profession. They include functional, person and business aspects. There is also a recommendation for each of these areas that a person who is entering this profession should acquire skills, which are necessary to efficient and effective use of the modern IT tools. In view of the reality this requirement is unquestionable. The answer to those guideline appeared in the article about a proposal to include Excel to the teaching program to the bachelors studies on Accounting Information Systems in the USA (Willis, 2016). The main goal of the project is to teach Excel in the accounting environment as well as levelling up the advancement of mastering Excel among students. In general, the point of the described project is executing various accounting tasks by students using the basic functionalities of Excel. Another good example of how Excel can be used in the teaching of accounting is the publication describing how to prepare an algorithm processing the data that would allow to establish the costs of orders. That article can be considered a case study or a tutorial for students (Kes, 2011). The use of modern technologies in teaching the accounting is very important because computer programs are the accounting tools today. It is also relevant to note that accounting uses various software types. Teaching students on the basis of a concrete program is impractical because in real life situation the student may face a completely different IT surroundings. Apart from that computer programs have fine-tuned functionalities and they do not inspire students creatively. So, as educational tools they do not contribute much to the didactic process. Therefore, a suggestion is made that teaching programs should focus more on tools that stimulate creativity, develop capabilities of students and allow them to approach every accounting program intuitively. Excel spreadsheet is the tool that can be used here in the best possible way. It is commonly used in business and it can also stimulate functionalities of any financial – accounting software. The subject is broad. It requires many analyses and investigations. The author of this publication hopes that it will be opened for further elaborations. Fluent knowledge of book keeping and tax regulations, accountancy bill, International Accountancy Standards, International Financial Reporting standards, or the US accounting standards (GAAP). Being acquainted with financial and accounting programs. Quite often names of popular programs are given here. Very good knowledge of Office software, including MS Excel. Fluency in use of foreign languages where English is most often mentioned. Such requirements seem obvious when we think about global economy, free flow of business activities between different countries as well as commonly used accounting tools such as computer programs. It can also be expected that due to the Uniform Control File that was introduced by the Ministry of Finance in 2016, computerization of companies will be more dynamic. This, in turn, implies commonly used electronic data exchange and so the use of modern IT tools will become mandatory. It is therefore amazing that education still uses old fashioned accounting tools, methods and techniques that were used many years ago. It has to be admitted that during trainings on accounting practical classes are held where information systems are presented. Such presentations are only instructional. Moreover, great variety of programs that are used by accounting departments makes that teaching one particular program would not improve competence of a trainee. It should also be taken into account that high prices of accounting programs often make them unattainable for many universities. Sometimes the lack of well-prepared teachers having experience in such a programs eliminates them from the teaching agenda. Overview of the available handbooks that are used in teaching the accounting (tab. 1) shows that most accounting principles are explained based on the T-account, which is over 500 years old. Moreover, the nomenclature, which is used in T-account also is outdated and differs significantly from real life situations where the most basic words are derived from the use of computer programs. A good example is an expression standing for the opening of the account, which means entering an initial record into the T-account, while in the accountant’s position one speaks here about “opening balance” rather than “initial turnover”. Both these forms showing the initial situation should be balanced. However, when T-accounts are used this is not always considered (recording the so called “opening balances”. The situation is similar when T-accounts are to be closed and the closing balance established. In accounting reality we speak about closing the accounting period and not accounts. Such things may be seen as irrelevant details but they may create confusion for a person who is just entering the profession. Without diminishing the educational value of T-accounts, which proved their value not only during past decades but also centuries the change to the use of information tools and Excel spreadsheets must simply be recognized. The significance given to accounting departments as information system in companies imposes that efficient teaching of accounting principles should be set as top priority. While a rigorous system of assessing the effects of accounting education has been developed, through the various certifications and examinations admitting to the profession, teaching the accounting principles uses techniques and methods that have not been modified for years. In the context of the above considerations next research questions can be asked: Do current teaching methods and techniques fully meet the needs of preparing students for accounting work? Is explaining of accounting methods on T-accounts a sufficient way to present knowledge concerning recording economical operations? 83 people took a part in this research. The group consisted mostly of people who had participated in trainings related somehow to the changes that would be caused by the introduction of the Uniform Control File by the Ministry Of Finance as well as of other people related to accounting. They constituted in 42,7% employees of accounting departments and in 34,1% people who managed financial departments. They were supposed to answer 14 questions (as in the attachment). All questions that started with: “do you agree with the statement…“, the replies were from the 5-stage Likert scale. 94% of the respondents earlier participated in some kind of trainings on accounting what allows us to assume that their answers were based on experience. The second question was supposed to evaluate popularity of T-accounts during accountancy classes. Replies (“always” 39% and “often” 47,6%) confirm the use of T-accounts as the most basic tool (86,6%) during such classes. The replies to the questions: four, five and six were an attempt to refine information that was acquired from asking the question number three. The point was that the respondents could make precise in what kind of bookings T-accounts were a good solution to make records. Table 2 shows subjective evaluation of the respondents in this question. Table 2. Respondents opinions concerning the efficiency to use the T-account. The following question, number seven was related to the knowledge of tools that were different from T-accounts and that were used in the teaching of accounting. The answers to this questions presented the situation in a clear way. Only 26% of the respondents declared the knowledge of other tools. The two: descriptive method and the use of computer programs were repeated most often. Only in one case Excel spreadsheet was mentioned. The next questions (from nine to twelve) dealt with the use of Excel spreadsheet in the classes on accounting. Analysis of the replies shows that despite the fact that knowledge of Excel is pretty much required in the accounting job, it is not used during trainings at all. Table 3 shows the compilation of answers to the question 9 of the questionnaire, concerning the use of Excel Spreadsheet in the trainings on accounting. The last three questions were asked in order to evaluate a general attitude towards the use of Excel Spreadsheet as a tool that could support teaching of accounting. When we analyze the answers to the last questions we could point to the lack of a firm conviction about the need to include the use of Excel Spreadsheet into the accounting classes. The answers that would imply that such a need exists made 61%, but only 42,7% of the respondents considered Excel to be a good tool that could help in understanding the accounting principles. 59,7% of the people who took part in the questionnaire stated that Excel is seldom used during the classes on accounting. Such small approval to include Excel Spreadsheet in the education of accounting students may derive from a relatively small knowledge of possibilities that the tool offers as well as a complete lack of experience in the use of Excel for educational purposes. Such a conclusion can be drawn based on relatively big percentage of the “neither yes or no” answers or “I have no opinion”, which accounted for 43,9%, 21,9% and 34,2% respectively. Table 4. the use of Excel Spreadsheet as a tool to support teaching of accounting. When we sum up the results of the examination we can say that the accountants who were educated based on T-account do not see any special need for Excel spreadsheet to be included into the modern education system of accountants> they believe that the T-account is a good tool to explain all accounting principles (tab 2). That phenomenon is disturbing because the need for accountants to use Excel is unquestionable today. In this context the role of universities and training centers grows significantly to include Excel spreadsheet as an mandatory tool in teaching accountancy. Earlier considerations that were presented in this article emphasized the role of Excel in the accounting activities in the first place as well as ability to use it being a necessary competence of the modern accountants. They pointed also to the fact that it was completely neglected during accountancy classes and there was almost no need noticed to engage it in the presentation of the accounting principles. It is also important to note that the tools, which are used to make accounting records that had been used before computerization of enterprises (such as Technical table method, called “American method” or “Render accounting method”) were compatible with T-account. That gave opportunity for the learning person to use own experience in an understandable and practical way. What was the basis of this compatibility? In the vertical approach to these accounts: account (as a notion), where a record was made, was presented on top, and these accounts were located next to each other (drawing 2). Current tools such as computer software are oriented horizontally, because records are made as the so called: data records (drawing 3). Identifying of this basic difference is relevant due to the ways how stunts understand accounting process. Figure 2. Compatibility between T-account and the American method. Teaching accounting with the use of technics such as T account, which explain only accounting principles (eg. Double record), and they do not say anything at all about entering data as records, where all information is next to each other in one line, makes that it is difficult for a student to relate what he learned on accounting at school with practice. Having completed trainings on accounting people who start working often wonder where those T accounts are and they cannot find them in their PC. In a sense, they need to start learning accounting principles from the beginning. In that new, computerized reality it is imperative that new accountants study IT tools. Figure 3. Entering data in a computer program, by creating records. In reply to clearly identified demand, the author has prepared a tool, which should be used in the teaching the accountancy. The tool is a properly designed Excel Spreadsheet. My intention to join the tool for teaching accountancy with the Excel Spreadsheet was to create a universal instrument to allow students both learning accountancy and the functionalities of Excel. White testing the effectiveness of that tool it turned out to have many more advantages over T-account that it had been initially assumed. All these advantages have been listed in the summery to this article. The designed instrument, which has been called Asystent Nauki Dekretacji (AND) [Eng. Accounting Learning Assistant (ALA)], and it is one of the elements of the author’s own ALA Methodology. According to the definition, methodology is a part of the detailed didactics, which is involved in the search for effective ways of teaching of particular topics (…). Not showing special investigating aspirations, which are typical for subject didactics, teaching methodology (as practical discipline) comes to the search for the ways of rational activity through possibly thorough analysis of topical contents as well as based on the teachers’ experience, recognition of methods and means enabling the students mastering those contents (Czerwonka, Waszkuć, 2006). Stimulating of students’ creativity by making recommendations, to which the functionalities of the ALA tool can be expanded. Making students use summing, sorting or data analysis functionalities of Excel in different accounting tasks. Joining the ALA functionalities with functionalities of computer programs. Use the formulas by the lecturers that allow to check tasks quickly and minimize the risk of errors. Saving time by using Excel in teaching accounting as well as automation of calculations by use of Excel formulas, thus diminishing the risk of errors and improving analysis of recorded data. Using Excel in accounting, students can improve the “AND” tool with new functionalities by themselves, which can make it even more efficient. And the students develop their analytical capabilities, which makes it a creative introduction to reporting and financial analysis. ALA tool, which was designed according to the IT programs software enters data by creating records, and by this prepares the students to use IT tools intuitively. Correcting the tasks by a lecturer can be done more effectively, and with less risk of errors. simultaneous teaching of accounting, excel spreadsheet as well as the English vocabulary, which is related to accounting. Designing the ways to better arrange , execute, store and verify accounting tasks. Figure 4. Posting in the ALA tool. Account description [account name], downloaded through a proper formula from the sheet [account plan]. This spreadsheet downloads amounts through certain Excel formulas and enters them in proper fields, which are entered in the assigning sheet. In this way, a basic accounting report is created, which is The trail balance. Both spreadsheets: assigning and Trial balance are equipped with the controlling formula, which checks if records are comparing what comes from the double record principle. The next spreadsheet [Records] includes the table, which is a copy of the table from the first sheet [assigning]. The formulas that are created here aim at copying records from the table in [assigning]. This spreadsheet, however, has a filtering option, which allows to watch all records on a selected account, similarly as it was possible in the T-account (Fig. 6 and 7). Joining the sheet “records” to the ALA created opportunity to watch the records from the same perspective as it was given by T-accounts. Figure 7. Filtering data in the table “records” in the ALA tool. Figure 7 shows records from the 130 account, including operation numbers and amounts. The proper formula gives the account balance. Figure 8. Account number list suggests the assignments in the AND tool. This solution is necessary to ensure the correctness of the entered data. In the extended version the spreadsheet [assigning] gets more tables. They simulate entering economical operations in different reporting periods (Fig.9). Other spreadsheets can also be added (calculating the payroll, depreciation (depreciation table), or accruals, which are used in accounting. In the extended version another table can also be added, which can generate from the sheet [Trial balance] the balance statement (Fig. 10). The ALA tools that are prepared by students in Excel sheets can also be a part of accountancy classes, because all used formulas include principles that are used in the accounting. Figure 10. ALA tool, extended version. As it was mentioned earlier it is the ALA methodology goals to teach simultaneously accountancy and the use of Excel, as well as to stimulate creativity of students. That version of the ALA tool, may join both elements of the basic (for presentation) with the extended one (for examinations). Its peculiar feature is that both the language and the account plan can be changed. The change of the language is done by selecting ENG in the top left corner of the first screen of the sheet (Fig 11 and 12). As a result of setting a language all descriptions in the ALA tool will be shown in the selected language, and in the header (assignment) in the cell: “account” in the selection list a proper account plan will be suggested. Initially the ALA tool has two languages defined: Polish and English as well as two account plans: Polish and British. An option to switch between languages in the ALA tool, allows to simultaneously learn the vocabulary related to the accounting as well as other than Polish account plans. It is very important if we think about expected competences related to the future profession. In the near future closer co-operation with accountants in Ireland is planned. This will allow to prepare a ALA tool adjusted to the Irish accounting. Between October 2016 and February 2017, the author of this article conducted a series of classes “Certified Independent Accountant” in the Institute of Accountancy and Taxes in Warsaw. The training aimed to introduce students to and train them in the basics of accountancy. There were no computers, only a projector, so the students completed their tasks on the board and in their notebooks while observing the teacher’s presentations projected on the screen. The example tasks during the classes were solved with the help of T-Account, while all the students’ homework was solved with the help of ALA Method. The final exam was designed using the ALA Tool (advanced version) (table 9 and table 10). Due to lack of time, students who took part in the training worked on a ready ALA Tool, which was designed by the teacher. However, they also exchanged a number of useful suggestions as to how the tool could be improved and developed. Figure 13. Table evaluating the ALA tool for the participants of the IRIP training. All the opinions were positive and the tool received high scores. One of the students, having a diploma in finance to her name, stated in her written opinion that she had gained more skills and experience during this short training than during her whole college education. All the students expressed their satisfaction at the fact that they not only learned the basics of accountancy, but also had a chance to learn Excel very well. Taking into consideration the demands that the accountants face in today’s industry, a new teaching approach is required – the approach which would take into account the current legal, organizational and technological challenges. The author believes that the arguments provided in this article W artykule przedstawiono argumenty, które powinny przekonać do rozpoczęcia takiej ścieżki edukacyjnej dla księgowych. 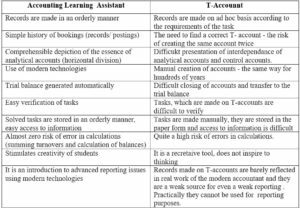 Table 5 lists the advantages of teaching accounts with the help of Excel, all of which should help to prove the need to upgrade the current teaching methods by intensive use of all the available modern technologies. Table 5. 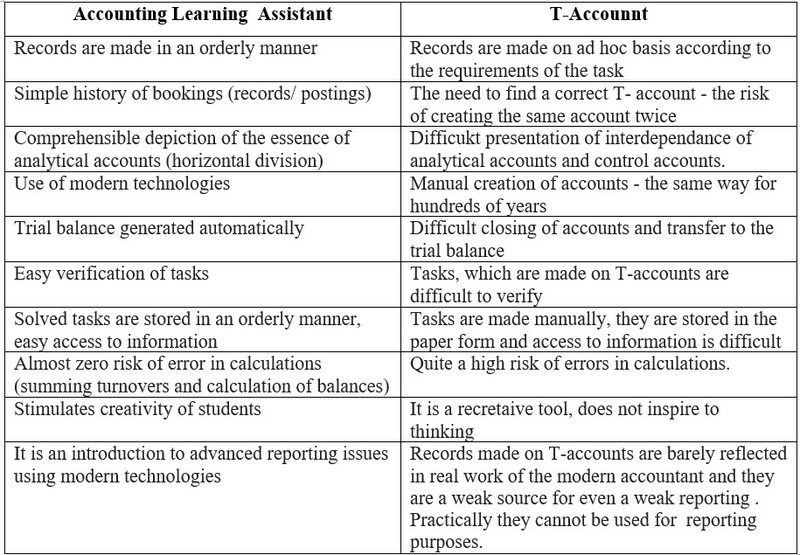 Comparison of the accounts teaching tools. The author also suggests further study and continued research into this issue. The first survey worth taking should examine the levels of analytical, comprehensive and professional skills of the students in two different groups: taught with the help of the T-Account and the ALA Tool, respectively. Another survey that could prove that the use of Excel as an accounts teaching tool is reasonable should be to analyse the levels of satisfaction among the students using the ALA Tool, or to examine its effectiveness in the learning process. Since the T-Account seems to be continually less adequate in the digitalised world of today, the time has come to replace it with the tools that are more relevant in the current technological reality. In that way, education of the accountants should better match their future profession. The proposed process should help with better education of the accounts students, which in turn should prepare them better for their future job in the industry. This issue is very broad, but the author believes it is worth exploring and researching further. Chomuszko, M. (2017). Nowoczesny księgowy – nauczanie rachunkowości przy użyciu Excela. Kraków: Wydawnictwo Ridero. Cicha, A. (red.). (2014). 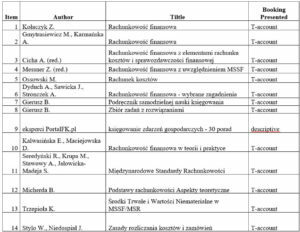 Rachunkowość finansowa z elementami rachunku kosztów i sprawozdawczości finansowej. Warszawa: Wydawnictwo SKwP. Czerwonka, E., Waszkuć, E. (2006). Metodyka nauczania przedmiotów, materiały szkoleniowe. Kielce: Wyższa Szkoła Handlowa w Kielcach. Dyduch, A., Sawicka, J., Stronczek, A. (2014). Rachunkowość finansowa wybrane zagadnienia. Warszawa: Wydawnictwo C.H. Beck. Gierusz, B. (2008). Podręcznik samodzielnej nauki księgowania. Gdańsk: Wydawnictwo ODDK. Gierusz, B. (2008). Zbiór zadań z rozwiązaniami. Gdańsk: Wydawnictwo ODDK. Gmytrasiewicz, M., Karmańska, A. (2010). Rachunkowość finansowa. Warszawa: Wydawnictwo Difin. Kalwasińska, E., Maciejowska, D. (2011). Rachunkowość finansowa w teorii i praktyce. Warszawa: Wydawnictwo Naukowe Wydziału Zarządzania Uniwersytetu Warszawskiego. Kes, Z. (2011). Przykład wykorzystania programu MS Excel w nauczaniu rachunkowości zarządczej. Folia Pomeranae Universitatis Technologiae Stetinensis. Oeconomica, 287(63), 73–79. Kołaczyk, Z. (1999). Rachunkowość finansowa. Poznań: Wydawnictwo Akademii Ekonomicznej w Poznaniu. Księgowanie zdarzeń gospodarczych – 30 porad ekspertów. PortalFK.pl. Warszawa: Wydawnictwo Wiedza i Praktyka. Messner, Z. (2016). 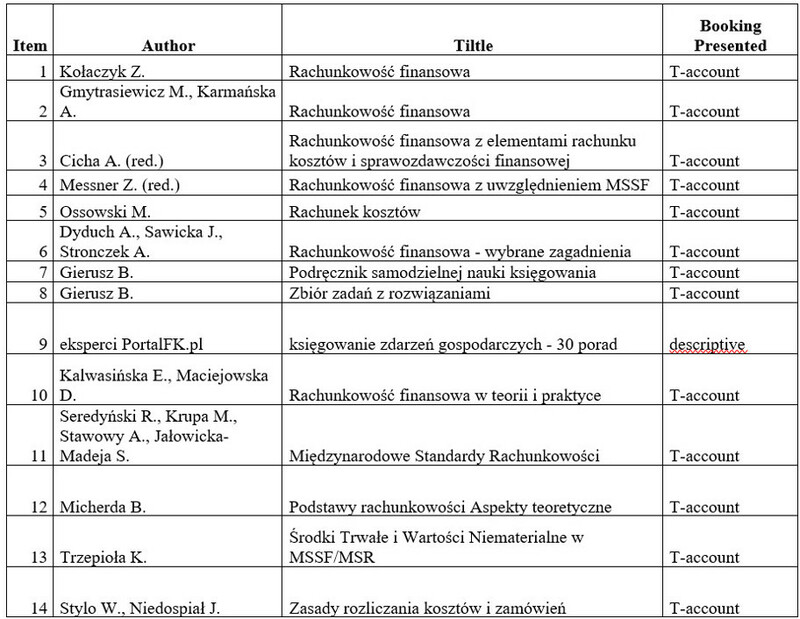 Rachunkowość finansowa z uwzględnieniem MSSF. Warszawa: Wydawnictwo Naukowe PWN. Micherda, B. (2005). Podstawy rachunkowości Aspekty teoretyczne. Warszawa: Wydawnictwo Naukowe PWN. Ossowski, M. (2014). Rachunek kosztów. Gdańsk: Wydawnictwo ODDK. Seredyński, R., Krupa, M., Stawowy, A., Jałowicka-Madeja, S. (2009). Międzynarodowe Standardy Rachunkowości. Warszawa: Wydawnictwo Poltext. Spraakman, G., O’Grady, W., Askarany, D., Akroyd, C. (2015). Employers’ perceptions of information technology competency requirements for management accounting graduates. Accounting Education, 24(5), 403–422. Stylo, W., Niedospiał, J. (2002). Zasady rozliczania kosztów i zamówień. Kraków: Uniwersyteckie Wydawnictwo Medyczne „VESALIUS”. Trzepioła, K., (2007). Środki Trwałe i Wartości Niematerialne w MSSF/MSR. Warszawa: Wydawnictwo Fundacja Rozwoju Rachunkowości.